‘Captain Fantastic’ Zander Diamond scored twice as Mansfield Town extended their unbeaten run to nine games with a thumping 4-0 victory away to Port Vale tonight. 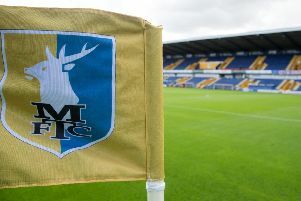 With his first League goals for the club, Diamond netted his opener moments before half-time with a glancing header, before doubling his and the Stags’ tally after the break. Top scorer Danny Rose, back in after a one-game ban, added a third just minutes later with a display of delightful skill, with Kane Hemmings also getting his name on the scoresheet after going one-on-one with Valiants’ goalkeeper Ryan Boot as Stags made it three League Two wins and three clean sheets on the trot ahead of Saturday’s big local derby. It was Vale who had the first chance to opening the scoring just before the half hour mark, Anton Forrester denied by a superb tackle from Rhys Bennett. Forrester was the first man in the book, and was lucky to stay on the field just moments after his effort on goal following an apparent elbow to Diamond’s face. Gavin Gunning looked to have opened the scoring for the hosts only to see his header cleared off the line, but it was Mansfield who finally broke the deadlock just before half-time. Hayden White received the ball from a quick free-kick before whipping a cross into the centre of box, Diamond getting the all-important touch to put his side ahead. Two more goals followed in quick succession after the break, Diamond getting his second of the game with a half-volley from Alex MacDonald’s corner. Just two minutes later, Rose added a third with a stunning effort, bringing White’s pass down onto his chest before firing home with a left-footed half-volley. The Valiants almost pulled one back through Pope on the hour mark, Paul Anderson heading his effort off the line. But a fourth was always coming for Steve Evans’ men, and it came courtesy of Hemmings who beat the offside trap before placing the ball past Boot into the hosts’ net. VALE: Boot, Gibbons, Smith, Anderson, Gunning, Worrall, Myers-Harness, Pugh (Tonge 72), Denton (Montaño 56), Forrester (Pyke 69), Pope. Subs not used: Hornby, Yates, Reeves, Turner. STAGS: Logan, White, Diamond, Bennett, Hunt, Anderson, MacDonald, Byrom (Atkinson 70), Hamilton, Rose (Spencer 77), Hemmings (Butcher 86). Subs not used: Pearce, Mellis, Olejnik, Sterling-James.